Lalava is the Tongan art of lashing or binding. 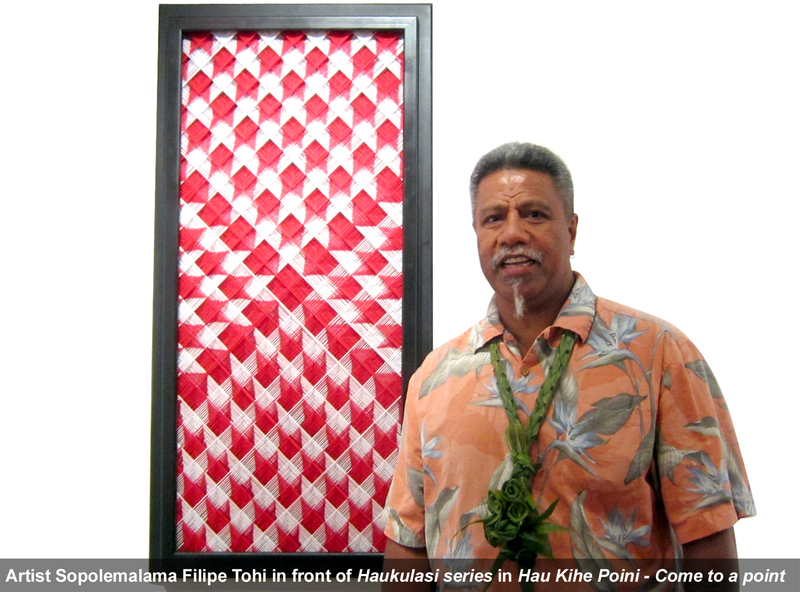 It is this traditional technique and holistic art form upon which master artist, Sopolemalama Filipe Tohi, bases his cross-disciplinary art practice. In Hau Kihe Poini - Come to a Point, Tohi interprets the lalava pattern into various materials and art mediums. For Tohi, the lalava pattern is a core system that can be continuously rearranged into geometric abstractions to create optical intrigue. Through line, repetition and perspective shifts that can be reversed and inverted Tohi illustrates the essential relationship lalava has to ways of seeing and living. Lalava translates as the intersection of space. For more than two decades Tohi has been researching and working with the lalava artform and is a Tufunga Lalava, a chief craftsman of lalava. Sopolemalama Filipe Tohi is a Tongan born artist that has been based in New Zealand since 1978. An internationally renowned artist and sculptor, Tohi has exhibited extensively overseas and completed major public sculptures in Tonga, Fiji, Japan and China. In 2012, Tohi presented a major outdoor sculpture for Auckland Art Gallery Toi o Tāmaki and his lalava craftsmanship is featured in The University of Auckland’s Fale Pasifika. Tohi’s works are held in public collections including Te Papa Museum and Auckland Art Gallery Toi o Tāmaki.